Today I attended an expo at the Devon & Somerset Fire Services with Tom Brown and Robin Kennedy. In preparation for the event I built a few dashboards for us to showcase. 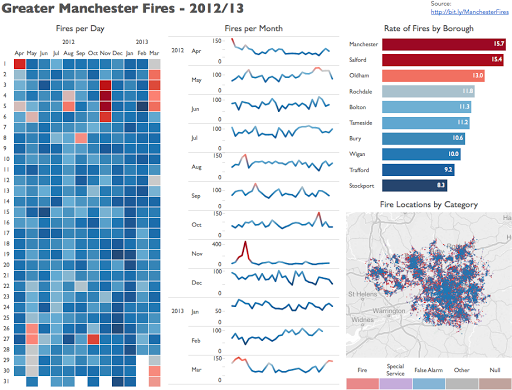 A friend of ours over at Surrey County Council pointed me to a dataset about fire incidents in the Greater Manchester area for 2012/13. The beauty of this dataset was that it included the locations of the fires and lots and lots of details about the fires. Tom asked me to build something, so I started exploring by building lots and lots of visualisations to see if a story stuck out. And one did! When I created a heatmap of fires by month and day, November 4th and 5th jumped right out. That seemed a bit strange to me. I think of those dates as near elections, but here in the UK it the celebration of Guy Fawkes Day and there are lots and lots of fireworks. And, duh, fireworks = fires. I also noticed some outliers at the beginning of March, which I still haven’t been able to explain, April Fools Day had a lot of false alarms (shocker! ), and August 5th and October 27th were near bank holidays, which probably means fires from BBQs. Yet another fun couple of hours exploring data with Tableau. It was a lot of fun showing these off to potential customers today and also seeing a bit more about the sales side of the company. Great learning indeed! Very interesting dataset and viz. i wonder whats the march spike about, only think i can think of is the first bonfires in spring. Although i love the use of sparklines this does show a problem with them when you have one single event, 5th Nov that massively skews the numbers. You have independent axis for each ones, which makes it hard to compare month by month, and people might not see the difference in numbers. However if you fixed the axis the November numbers effectively make the rest of the lines almost flat, so loose any details. Very tough choice, not sure what the best answer is.